Make of it what you will. But for YouTube’s sake I hope the original report is correct, because Google really needs to do something big in live streaming, and soon. Having lost out last year in its bid to acquire the live game streaming site Twitch.tv, which Amazon snatched away at the last minute for $940 million, Google has largely been a bystander as user-generated broadcasting has taken off. In January, Twitch announced that its average monthly global users had reached 100 million, more than double what it had been when Amazon bought it. It has added support for new platforms, such as game consoles, and has begun to expand into new types of content such as live music concerts. Just this week Twitch announced a deal to live-stream all three days of the Ultra Music Festival, which kicks off Friday in Miami. The live-stream will be exclusively sponsored by 7Up. The issue for YouTube is about more than bragging rights. It’s about audience. 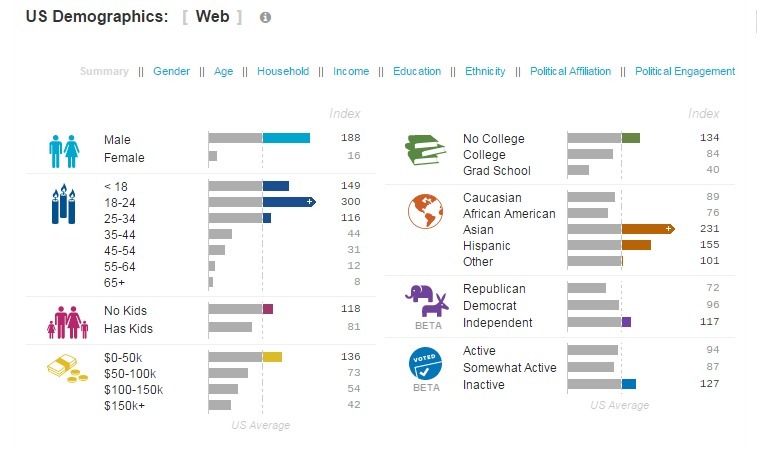 The Twitch audience way-over indexes on young males and has a pronounced skew toward Asians and Hispanics. It’s a portrait of the fastest-growing and most coveted segment of the population among marketers and generally among the hardest to reach. And as Twitch expands beyond games into other content verticals like live music it threatens to corner the market on them. YouTube attracts many of those same folks as well, of course. But the ability to engage the audience in real time thanks to Twitch’s live-broadcast platform holds strong and growing appeal to online marketers. As with YouTube at first, it will take some time for brands to warm up to Twitch and its off-beat content, and for marketers to figure out how best to use the platform. But audience is king in marketing, and marketing dollars follow the audience. The pull of real-time engagement already evident in the explosive growth of Meerkat. Barely a month old, the live-streaming app has already surpassed 300,000 users, despite being hobbled somewhat by Twitter, the platform it was built on. But as I postulated in a post last week, Meerkat is also attracting the eager attention of marketers. The Miami Dolphins, The Tonight Show with Jimmy Fallon, Mashable, CNN, American Idol, Spotify, Red Bull, Starbucks and MasterCard have all experimented with Meerkat in its first 30 days. Today, Twitter itself took the wraps off Periscope, its own recently-acquired live-streaming app, which is already getting good reviews. Notably, Periscope includes some of the features marketers have been clamoring for in Meerkat, such as a “save” option that allows a broadcast to be preserved and re-purposed. Periscope also offers the ability to limit broadcasts to a select group of friends or social contacts, a feature that will eventually give content marketers the ability to curate their own audiences. So far, YouTube has not come up with its own live-streaming mobile app, once again leaving the door open for that business to develop on someone else’s platform, in this case Twitter. Worse for YouTube, what track record it has in live streaming is nothing to boast about and in 2014 it removed any mention of live-streaming from its home page. One of its last big live-streaming events, in fact, was last year’s Ultra Music Festival, which this year will become Twitch’s first marquee live music event. Ouch. That’ll leave a mark, in more ways than one.